Day By Day Discoveries Daycare offers quality child care services for the Luxemburg Casco School District, Red Smith and Holy Cross Schools and areas. Since 1997, we have been a family owned and operated daycare with a professionally trained staff that assists you in understanding and enhancing your child's development. From 6 weeks to 12 years we will provide the best quality child care service at affordable prices. Day By Day Discoveries Child Care Center provides a safe, clean environment for your child and we will work with each of our families to meet your needs. 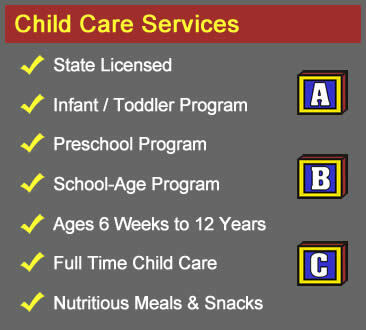 Our daycare programs are for infant, toddler, preschool and school-age up to 12 years. We provide nutritious meals and snacks each day, a spacious outdoor play area and both part-time and full time child care. Our hours of operation are from 5:30am until 6:00pm Monday thru Friday. We have built a great reputation in the community because of our exceptional care and quality staff. Day By Day Discoveries Child Care Center will provide your children with wonderful experiences, activities and a caring environment. "Back in 2008 when we had been touring the daycares in the area to make “our switch” Coleen was so professional and definitely went above and beyond to make sure we were comfortable sending our child to her daycare. At that time we could have never known that everyone at Day By Day would impact our families’ lives in such a positive way. Our children have learned so much in the Preschool program that is offered, which prepared our children to be ready for school. The kids always got what they needed from all of the teachers, whether it would be an extra hug in the morning or a little snuggle time on the rocking chair because they were feeling sad, everyone at the center made it easier for us to drop them off. We knew and have always known the kids would enjoy their time at Day By Day Discoveries." "Right from the start I knew this would be the best place for my daughter to attend. Coleen, the director was very thorough with her orientation with my husband and I and was very friendly and accommodating. Sophia started when she was 3 months old and it was I that had the harder time, not Sophia. Again, I'll never forget Sara telling me, you can call as many times as you'd like to check in on her". Krista and Jessie, the baby teachers, are so caring, calm and compassionate with the babies. I'm serious when I say those babies are always smiling when I walk by the room. Sophia had some delays from sitting up late, being able to sit in a little child chair to eat, then walking and now potty training. At each stage in her development EVERY teacher was patient with her, encouraged her and helped her reach those goals. I have not had a negative experience with any staff member at Day By Day. I would encourage anyone and everyone to enroll their child in Day By Day because I know your child will be well taken care of, happy, and learn a lot!" "When looking for child care, every parent wants to be assured that their child will be in the best hands should something unthinkable happen. I can tell you from experience that your child couldn't possibly be in better hands than with the staff at Day By Day. When my son was just 5 months old, he experienced a severe allergic reaction while at daycare and lost consciousness. The staff responded quickly with their infant medical training and he came to a minute later. What comforted me the most was the emotional reaction of his caretakers. They didn't hesitate to ride in the ambulance with him and stayed at the hospital until they were absolutely certain he was going to be okay. They also insisted that we call with an update to let them know how he was. I knew right then and there just how invested these people are in our children's well-being and development. If you choose to enroll your child at Day By Day, rest assured that they are in the BEST hands possible and will treat your children like family." "Day By Day Discoveries offers an extremely safe, healthy, clean, educational and fun environment. Every day, our toddler is learning new social and academic skills and our preschooler is getting more prepared for the kindergarten experience. He has also been on some amazing field trips with his class. The teachers love our kids and our kids love them! We would recommend Day By Day Discoveries to anyone looking for a quality childcare center with teachers who love and care about your children as much as you do!" "When I first dropped my son off at Day By Day Discoveries 2 ½ years ago, I was a new mom. I was crying knowing I was going to be apart from him. The staff at Day By Day Discoveries consoled me, encouraged me to visit him during the day, and call as often as I wanted. Fast forward 2 ½ years, and I have just recently dropped off my baby girl for her first day of day care. This day was much easier compared to when I dropped off my son for his first day. Through these 2 ½ years, I have gained so much trust, respect and confidence in the staff at Day By Day Discoveries. I am entrusting my children in their care, and I feel totally at ease about it. I know my children are in good hands. A big, whole-hearted thank you goes out from my family to the staff at Day By Day Discoveries." © 2008 Day By Day Discoveries Child Care Services. All Rights Reserved.